America has a sordid repressive history. Among others, First Amendment rights are violated. It guarantees freedom of religion, expression, to petition government for redress of grievances, and right to peacefully assemble. The 1798 Alien and Sedition Acts restricted First Amendment freedoms. So did 1919 anti-communist Palmer raids, the 1934 Special Committee on Un-American Activities, its House Un-American Activities Committee (HUAC) successor, secret FBI COINTELPRO crackdowns, the 1996 Anti-Terrorism and Effective Death Penalty Act, the 2001 USA Patriot Act, and other post-9/11 measures. These and other measures expanded government surveillance, eroded habeas, formalized military tribunals, permitted torture-extracted confessions, and instituted violence for national security. FBI "terrorist profiles" can investigate anyone for any reason. So can local police working cooperatively or alone. Street protests can be criminalized. America's right to dissent is endangered. On October 28, 2011, DC Superior Court Judge Russell Canan found eight Veterans for Peace (VFP) members guilty of "failure to obey" and "blocking/incommoding." Fined $150, it could have been much worse. Defendants cited First Amendment rights to petition government for redress of grievances. Founded in 1985, VFP opposes US-sponsored wars, saying help us end them. It also wants domestic and international law obeyed, and crimes of war and against humanity ended. During trial proceedings, Richard Duffee petitioned for international law experts to testify. Judge Canan denied them. Defendants will appeal his verdict. Last February, Democratic National Committee members chose Charlotte, NC for the party's 2012 national convention. Called "Wall Street of the South," city officials drafted an ordinance to make camping on public property a "public nuisance." It also prohibits "noxious substances," padlocks and other camping equipment, potentially able to impede traffic and create public safety concerns. In late January, it's expected to pass. "Unlike many cities that have well-developed regulations governing protest activity, our local regulations contain gaps that need to be filled." "The recent issues related to camping on city property have further amplified the need to review whether the city wants to regulate this activity during the DNC." A city councilman said once passed, overnight OWS stays will end. North Carolina's National Lawyers Guild cited constitutional issues and possible "increased confrontation between protesters and police." OWS organizer Luis Radriguez said everyone calls Charlotte's DNC "ground zero. Everybody wants to be involved. We're estimating several thousand coming from the Occupy community." Organizing an alternative convention was proposed. Tampa will host the 2012 Republican National Convention. Thousands of police will secure convention site areas. Officials expect up to 15,000 protesters in town. Federal and local authorities have contingency plans for anything. Homeland Security (DHS) calls national conventions, as well as G-8/G-20, IMF, World Bank and similar summits "national special security events." Whether or not Tampa plans anti-protest legislation, OWS and others present will be targeted, constrained and perhaps evicted. Constitutional rights will be denied. Freedom will take another body blow. On January 18, Chicago's City Council will consider Mayor Rahm Emanuel's anti-protest measures. Occupy neighborhood groups said provisions will chill constitutionally protected political speech. They reduce protest durations to two hours and double fines for arrests. Public parks and beaches would close until 6AM, two hours later than now. In addition, loud noise, amplified sound, and music at parades and public assemblies would be allowed only between 8 - 10PM. Other provisions restrict parade organizers and let city officials levy punitive fines. Chicago's police commissioner also could deputize law enforcement officials from federal and state agencies, including the FBI, DEA, ATF, Illinois State Police, Illinois Attorney General, Justice Department, Cook County State's Attorney, and others. Coordinated federal and local efforts target OWS protesters. Emanuel's very much involved. Proposed Chicago measures escalate repression. OWS and other protests are targeted. So are fundamental rights. In May 2012, federal and state SWAT team shock forces and snipers will threaten them when G-8 and NATO summits convene. According to an unnamed source, "(T)hey'll be able to shoot the head off a nickel from 500 feet." Don't bet they won't try! Post-9/11 repressive measures eroded them. Capitalizing on a window of hysteria, unchecked executive executive powers were granted. USA Patriot Act provisions compromised due process, freedom of association, and protections from unreasonable searches and seizures. They also authorized unchecked surveillance powers to access personal records, monitor financial transactions, as well as student, medical and other records. Virtually anything goes replaced constitutional protections. For the first time, "domestic terrorism" became a federal crime, applicable to US citizens and aliens. It states criminal law violations are considered domestic terrorist acts if they aim to "influence (government policy) by intimidation or coercion (or) intimidate or coerce a civilian population." In other words, nonviolent anti-war or global justice demonstrations, environmental or animal rights activism, civil disobedience, and dissent of any kind may be called "domestic terrorism," including OWS protests. With no hearing or notice, the Patriot Act's Section 806 lets authorities confiscate or freeze foreign and domestic assets of any individual, entity, or organization accused of engaging in, planning, supporting, concealing, or perpetrating acts called domestic or international terrorism against America. Even nonviolent protests are affected. Other harsh provisions give authorities wide latitude to twist the law perversely and advantageously. As a result, anyone associated with activities called terrorism may be targeted, whether or not true. Unprecedented in scope, sweeping executive powers were granted. Meaningful judicial and congressional oversight are absent. (1) Allowing unlimited roving wiretaps. (2) Authorizing government access to "any tangible item," including financial records and transactions, student and medical records, phone conversations, emails, other Internet use, and whatever else is surveilled. (3) Permitting alleged suspect organizations and individuals surveilled, whether or not evidence links them to terrorism or complicity to commit it. 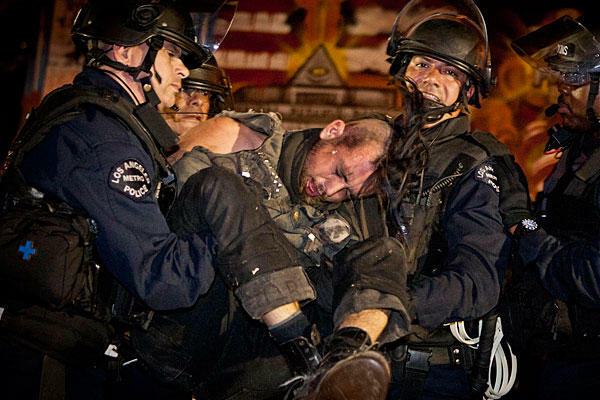 Provisions of the 2006 Animal Enterprise Terrorism Act can also target OWS and other protesters. Designed primarily against animal rights activists, it applies to other advocacy, protest activity, and all forms of civil disobedience. Moreover, repression's so extreme, anything can be called terrorism or activities connected to it threatening national security. In September 2010, FBI agents raided homes and offices of anti-war activists in Chicago and Minneapolis. Grand jury subpoenas followed. In June, the Supreme Court's Holder v. the Humanitarian Law Project decision ruled nonviolent speech and advocacy "coordinated with (or) under the direction of" designation foreign terrorist groups illegal. First Amendment protections don't apply. OWS and other protesters may be called terrorists. Indefinite detention in military prisons may follow. Citizenship rights are also threatened if congressionally introduced legislation passes. Called the Enemy Expatriation Act, it lets Washington summarily strip Americans of citizenship for "engaging in, or purposefully and materially supporting, hostilities against the United States." No corrorborative proof's needed. In other words, judicially fair convictions according to law don't apply. America's on a slippery slope toward full-blown tyranny. Freedom hangs by a thread. Anyone challenging state power is vulnerable. Constitutional protections don't apply. Presidential diktat authority replaced them. Martial law looms if so ordered. Nonviolent protesters are threatened. Freedom's fast going, going, gone.